This page expands on the basic ‘what you need to do’ guidance contained in the welders and managers pages. The information here is essentially background information but it may help you assess the level of risk at your workplace and hence decide if you need additional ventilation, fume extraction or RPE. The fume given off by welding and hot cutting processes is a varying mixture of airborne gases and very fine particles which if inhaled can cause ill health. How toxic is the fume? For arc welding, the visible fume comes mostly from the filler wire when it’s exposed to the electric arc. The amount of hazardous substances in the filler wire should be included in the product information that is printed on the original packaging. Many of the common metals used in filler wires are harmful and several have Workplace Exposure Limits (WEL). Cadmium and Beryllium are rarely found, but are particularly toxic. Chromium, Nickel, Vanadium, Manganese and Iron all have WEL’s. see Table 1 of EH40 for a complete list. Generally the smaller the number for the WEL the more toxic the substance is. The toxic constituents of fume can be affected by the choice of welding process. Stainless steel MIG welding fume usually contains about 18% chromium but most of it is ‘trivalent’ Chromium (WEL= 0.5mg/m3). Stainless steel welding using MMA equipment tends to contains less chromium (up to 8%) but most of it is the more toxic ‘hexavalent’ Chromium (WEL = 0.05mg/m3). This means that although there is more Chromium in MIG fume, overall the fume tends to be less toxic. If all the other factors are the same and it is practical, it would be preferable to use MIG/MAG welding techniques for welding stainless steels. It is generally accepted that stainless steel fume is more hazardous than mild (carbon) steel fume due to the higher chromium and nickel content. TIG and flame welding techniques do not normally involve putting the consumable directly in to the arc, they generate much less visible fume particles. For these techniques and also resistance welding and flame/ plasma cutting, the health risk from the gases found in the fume cloud becomes as important as the risk from metal particles in the fume. 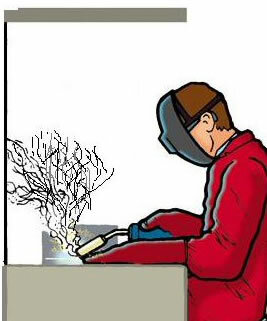 Flame cutting with an oxidising flame usually leads to increased levels of nitrous oxides. Using a reducing flame usually creates carbon monoxide. Both gases are toxic and have WELs associated. However they are not normally produced in large enough amounts to present a significant hazard provided there is good ventilation. The concentration of harmful substances will be highest in the plume of fume that rises from the weld point. As the plume rises it mixes with the surrounding air effectively diluting itself. Fans can be used to forcibly dilute it. In HSE guidance this is known as ‘forced ventilation’. The more air the fume can mix with – the lower the concentration of harmful substances. By reducing the concentration of harmful substances in the air, you reduce the level of risk. This is why it is important to try to work with your head out of the rising plume of fume. The enclosed nature of the workplace means that there is a restricted amount of air to dilute the fume. Forced ventilation can be used to increase the dilution particularly if the welding process will take a significant amount of time (eg more than 10 minutes). The predominant risk associated with aluminium welding is exposure to ozone. Exposure to ozone can result in streaming eyes and nose. A sore throat is often a symptom. In severe cases ozone can cause emphysema (water on the lung). Ozone exposure may make existing medical conditions like asthma, worse. Ozone is an irritant gas and has WEL of 0.2 ppm (0.4 mg/m3). The exposure limit is likely to be exceeded at most aluminium welding operations (particularly TIG) unless there is effective LEV or the welder wears suitable RPE. Optimise your shielding gas – compared to using pure Argon, using a gas containing 98% Argon 2%Hydrogen results in significantly less Ozone production when TIG welding aluminium. You will usually see production benefits (reduced arc time and weld quality) that can be used to justify any additional costs.